How to Make Your Pet, Cat and Dog Be Friends? This is so interesting, when you have pets cat and dog, and they do not quarrel each other. 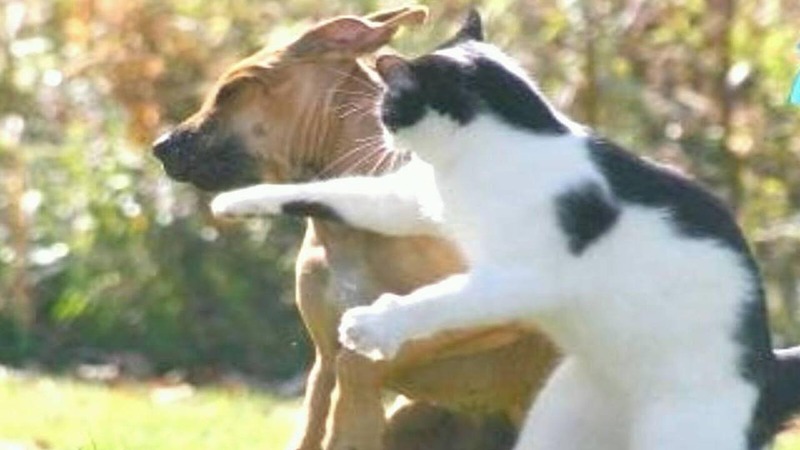 In the cartoons many show fights between dogs and cats. The question is whether these two animals are hostile? Cats and dogs are animals that are very close and familiar with humans, but if both meet, the situation becomes tense. What causes dogs and cats often quarrel? The main cause is because of the difference in the way they communicate. For example, the dog moves its tail to show friendship, but the cat moves its tail to frighten the enemy and sign he is angry. Then the cat makes a snore like a snore to show a good impression, but the dog considers the voice as a fight. But if dogs and cats since childhood side by side, they understand communicate with each other, there will be no hostility (before six months for cats and before a year for dogs). For the first time, put a line between the dog and cat rooms. Let them see each other. The dog will likely be very curious about the cat and may try to look around the room where the cat is located. Make sure the dog can not get into the cat's room. After a few days, depending on how the initial meeting, you can allow dogs and cats to be together. But still protect the cat, do not let the dogs and cats too close to each other. Get used to this method for a few days. As they familiarize themselves with each other you can see when you feel like allowing them to be together. It may take several days or even weeks for cats and dogs to work out their new relationship. Okay, that's all about these tips How to Make Your Pet, Cat and Dog Be Friends. If you think this article usefull for dog and cat lovers, please share this URL for them. Thanks for visiting and do not forget to leave your comment below.